What is and is not Fake News? Why is Fake News so attractive? Confirmation bias (noun) - The tendency to interpret new evidence as confirmation of one's existing beliefs or theories. Confirmation bias, also called confirmatory bias or myside bias, is the tendency to search for, interpret, favor, and recall information in a way that confirms one's preexisting beliefs or hypotheses, while giving disproportionately less consideration to alternative possibilities. 23% say they have shared a made-up news story – either knowingly or not. ...In case you don't think Fake News is a problem or that people don't really fall for it. How is it created and spread? How can we stop it? In March 2011, Eli Pariser, online organizer and author, coined the term "filter bubble" in hisTEDTalk, Beware online "filter bubbles". Now years later, we continue to deal with their effects. As of Wednesday, the company has once again changed its trending algorithms. Personal preferences are now out of the equation. "Facebook will no longer be personalized based on someone's interests," Facebook says in a press release. "Everyone in the same region will see the same topics." For now, a region is considered a country, so everyone in the U.S. should see the same topics. 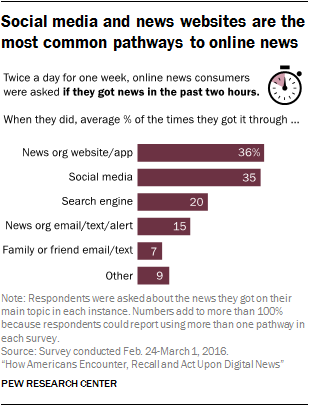 When following links, online news consumers could recall the name of the news outlet 56% of the time. "The digital manipulation of video may make the current era of “fake news” seem quaint."